The United Kingdom had the third largest e-commerce market in the world in 2015. The most recent UK governmental figures placed the value of UK e-commerce sales at 533 billion British pounds in the same year. 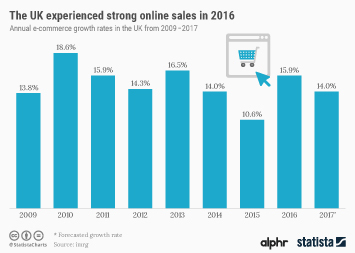 Estimates put the value of online retail sales in the United Kingdom at 60 billion euros in 2016, while net sales of the biggest online retailers in the UK added up to more than 80 billion U.S. dollars in 2017. Meanwhile, B2B e-commerce sales via a website amounted to roughly 96.5 billion British pounds in 2015. E-commerce accounted for a 19 percent share of total business turnover in the United Kingdom in 2015. As of 2015, roughly 80 percent of UK internet users did online shopping, the highest online shopping penetration rate in Europe. Despite the online retail market maturing, growth rates have slowed down in the last eight years. In 2015, online retail in the UK grew by 12.6 percent. Mobile e-commerce is a key growth sector. The mobile share of online sales in the UK grew from 0.4 at the beginning of 2010 to 50 percent in the first quarter of 2016. The m-commerce user numbers grew steadily for three years since mid 2013. Click-and-collect, or reserve-and-collect, also plays a key role in the UK online retail market, with 23 percent of online retail sales falling in this category during the third quarter of 2015.